The following execs served in just about every branch of the U.S. military prior to climbing the corporate heights, some for as long as 28 years. The first time ConocoPhillips CEO James Mulva and his wife Miriam left the country was to fly to the Middle East. "I went to school on the Navy ROTC program," he said during a 2009 interview at St. Norbert College. He remembers how he and his wife flew overnight to his first tour of duty on Bahrain Island in the Arabian Gulf. "We learned a great deal about a different part of the world and we learned that the Navy life was good," Mulva said, but after spending time in the Middle East during the oil boom, he decided that he would rather work in business. Soon after finishing his service, Mulva started his career with Phillips in 1973. 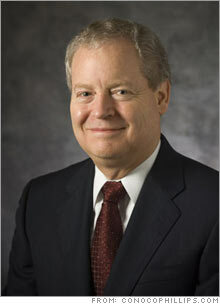 He stayed with it and served as chairman of the company from 1999 to 2002. Then, when the company merged with Conocco, he became CEO of ConoccoPhillips. Mulva will leave that post this year and will be replaced by ConoccoPhillips insider Ryan Lance. Exxon Mobil knocks Wal-Mart from the top spot. Who else made the top 50 this year?